Ticks have never been a good thing where humans and animals are concerned. There are various species of ticks. If they get accidentally torn off or purposely removed without also removing the head, a serious infection could set in. They are ugly, annoying, disgusting, and now they have a whole new characteristic – Lyme disease. If a tick that has Lyme disease sinks his head into a human or animal, it can transfer the Lyme disease to that human or animal. Though ticks can get into your home, they do not typically infest a home. There are some ticks that lay eggs indoors, one of which is known as the brown dog tick. They can, however, infest pets and other animals. About the only way to know if you have ticks is to actually spot them on your skin or one of your pets or livestock. However, if a disease has been transmitted to someone from the ticks, the symptoms of the disease will be a sign that ticks are present. Can ticks jump on me or my pets? They cannot fly or jump. They hold on to grass and leaves with their back legs and outstretch their front legs waiting to climb or grab on to animals or humans as they go by or after falling from trees. Will ticks fall off eventually if they are not intentionally removed? Ordinarily, we don’t even notice ticks until after they have begun feeding. After they are done feeding or full, their body swells up noticeably. Generally, they do remove themselves on their own after a span of about 48 to 72 hours. But by that time, the damage is done if they’re going to infect you with Lyme disease or another tick related disease. Particularly for pets, it is best to treat them preventatively for ticks, particularly if you live in a wooded area. What time of year are ticks most prevalent? From mid-August to November, and from March to mid-May, adult ticks are the most active. Unfortunately, any time the temperature is above freezing, ticks can be active as well. Need Help with Tick Control Today? Our pest control technicians do not visit your home or business as one of the stops on a route. Rather, they are dispatched to your home or business, are instructed to take as much time as is needed, and make sure that they identify the pest issue, and treat the existing problem as well as seeing to it that your pests never return. With more than 30 years of experience, PEST is the tick control specialist you can trust. Let us help you drive away the tick infestation in your premises. Call us at 212.945.0868 or email us at info@pesteliminationsystems.com to get started. 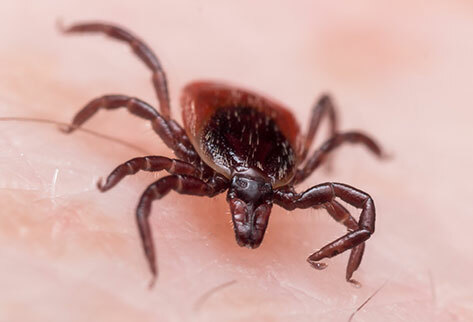 If a tick has Lyme disease, one sign of this bite can be a bull’s-eye rash. 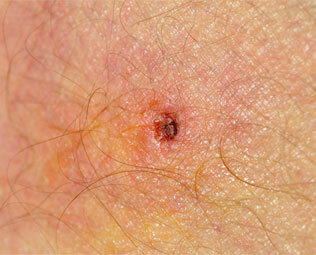 Burning sensation, itchiness, bite area exhibits redness at first sign. Other symptoms of Lyme disease can be fatigue, headache, and fever.